Carington Bowles - The road from Lincoln to Spittle, Glanford, Barton, Driffield, Kilham, Bridlington, Flamborough and Flamborough Head. An antique map from ' Bowles's post-chaise companion; or Travellers directory through England and Wales ' by Carington Bowles. 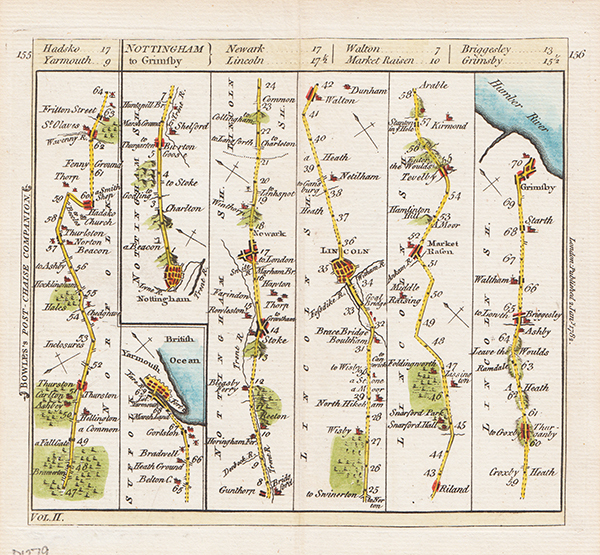 This is plate 83 and 84 and shows the road fromLincoln to Lincoln to Spittle, Glanford, Barton, Driffield, Kilham, Bridlington, Flamborough and Flamborough Head. Published in 1782 with later hand olouring. Carington Bowles - York to Whitby and Malton to Scarborough. An antique map from ' Bowles's post-chaise companion; or, Travellers directory through England and Wales ' by Carington Bowles. This is plate 189 and 190 and shows the road from York to Whitby and Malton to Scarborough. Published in 1782 with later hand colouring. 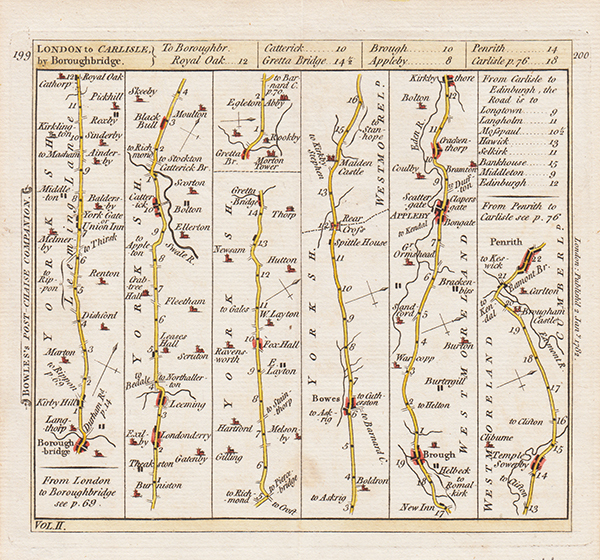 Carington Bowles - London to Carlisle by Boroughbridge. An antique map from ' Bowles's post-chaise companion; or, Travellers directory through England and Wales ' by Carington Bowles. 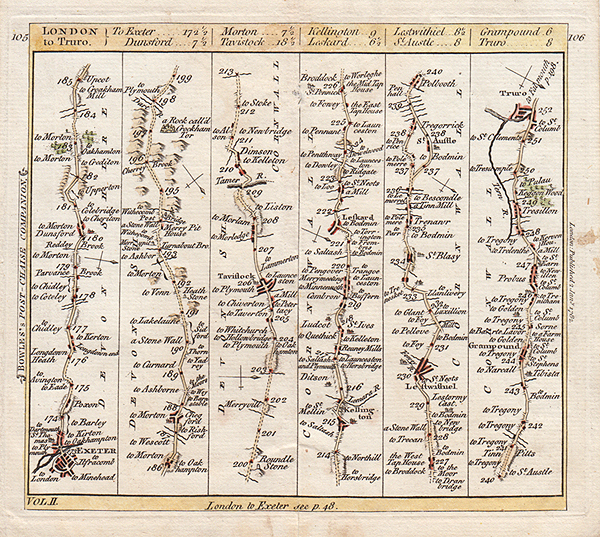 This is plate 199 and 200 and shows the road from London to Carlisle by Boroughbridge. Published in 1782 with later hand colouring. Carington Bowles - Ferrybridge to Sherburn, Tadcaster to York. Then to Boroughbridge, Topcliff, Sand Hutton to Northallerton. 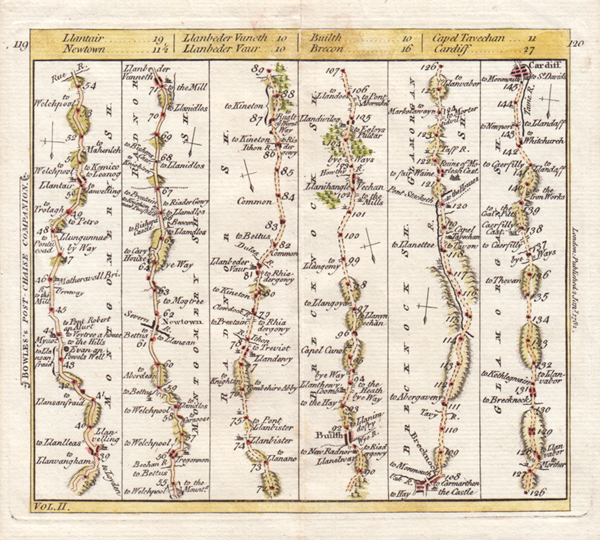 An antique map from ' Bowles's post-chaise companion; or, Travellers directory through England and Wales ' by Carington Bowles. 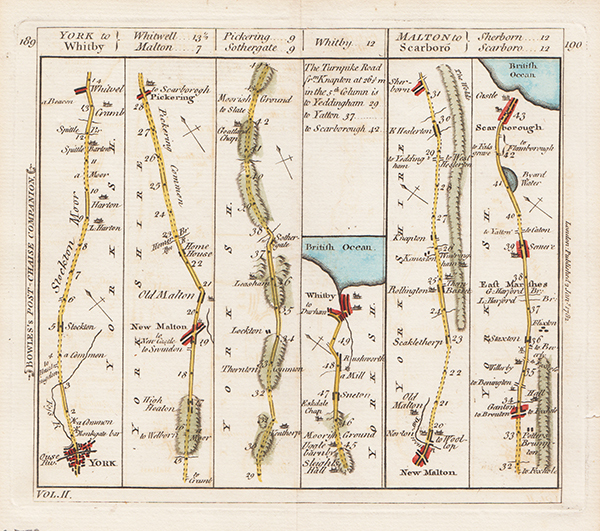 This is plate 13 and 14 and shows the road from Ferrybridge to Sherburn, Tadcaster to York. Then to Boroughbridge, Topcliff, Sand Hutton to Northallerton. Published in 1782 with later hand colouring. Carington Bowles - Halifax to Huddersfield, Keighley, Skipton, Kettlewell, Middleham to Tichmond. An antique map from ' Bowles's post-chaise companion; or, Travellers directory through England and Wales ' by Carington Bowles. 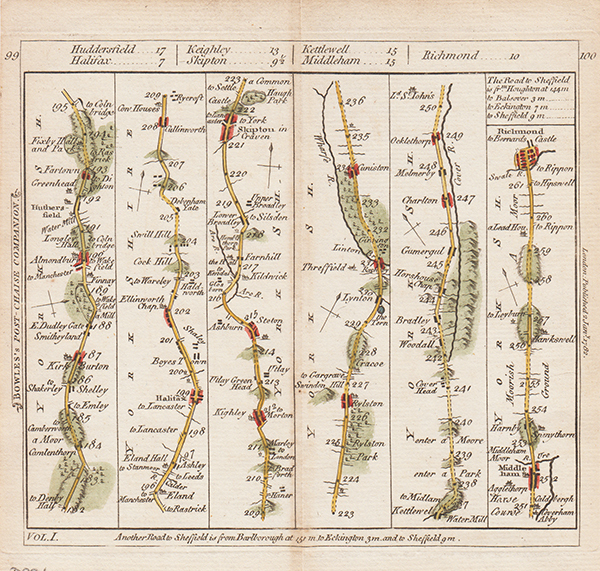 This is plate 99 and 100 and shows the road from Halifax to Huddersfield, Keighley, Skipton, Kettlewell, Middleham to Richmond. Published in 1782 with later hand colouring. Carington Bowles - Hadsko to Yarmouth and Nottingham to Grimsby. An antique map from ' Bowles's post-chaise companion; or, Travellers directory through England and Wales ' by Carington Bowles. 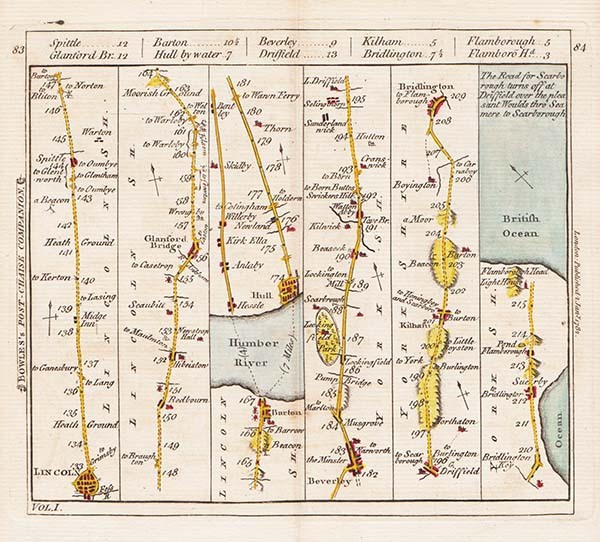 This is plate 155 and 156 and shows the road from Hadsko to Yarmouth and Nottingham to Grimsby. Published in 1782 with later hand colouring. Carington Bowles - York to Chester. An antique map from ' Bowles's post-chaise companion; or, Travellers directory through England and Wales ' by Carington Bowles. 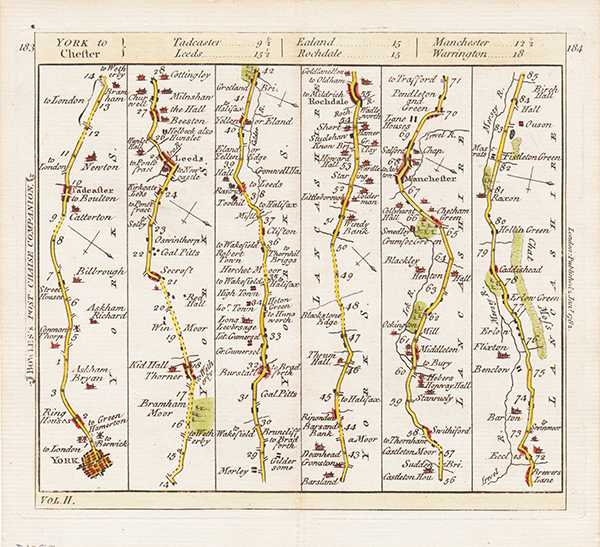 This is plate 183 and 184 and shows the road from York to Chester. Published in 1782 with later hand colouring. Carington Bowles - Whitby to Durham and Durham to Tinmouth. An antique map from ' Bowles's post-chaise companion; or, Travellers directory through England and Wales ' by Carington Bowles. 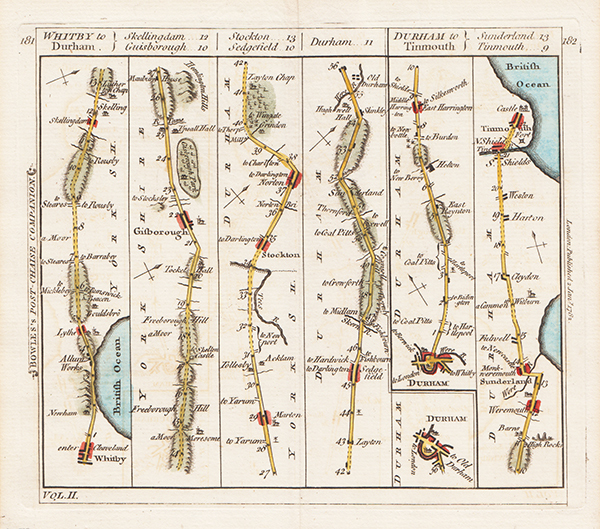 This is plate 181 and 182 and shows the road from Whitby to Durham and Durham to Tinmouth. Published in 1782 with later hand colouring. Carington Bowles - York to Lancaster. An antique map from ' Bowles's post-chaise companion; or, Travellers directory through England and Wales ' by Carington Bowles. 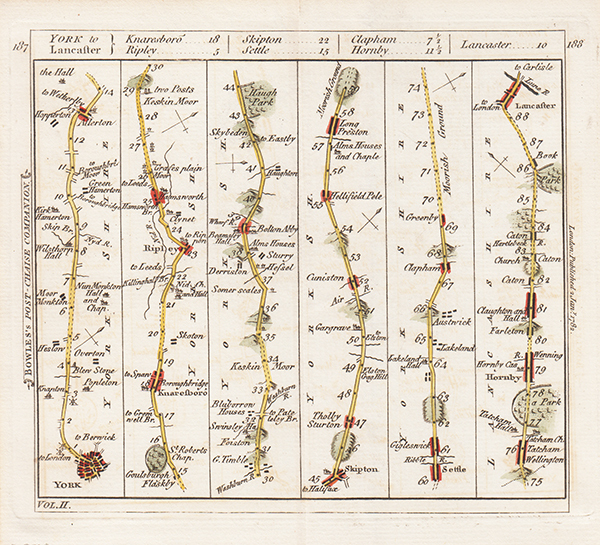 This is plate 187 and 188 and shows the road from York to Lancaster. Published in 1782 with later hand colouring. Carington Bowles - Exeter to Truro. An antique map from ' Bowles's post-chaise companion; or, Travellers directory through England and Wales ' by Carington Bowles. This is plate 105 and 106 and shows the road from Exeter to Truro . Published in 1782 . Later coloured by hand. Carington Bowles - Carmarthen to Aberystwyth. An antique map from ' Bowles's post-chaise companion; or Travellers directory through England and Wales ' by Carington Bowles. This is plate 131 and 132 and shows the road from Carmarthen to Aberystwyth. Published in 1782 . Later coloured by hand. Carington Bowles - Llanfyllin, Montgomeryshire to Cardiff. An antique map from ' Bowles's post-chaise companion; or, Travellers directory through England and Wales ' by Carington Bowles. 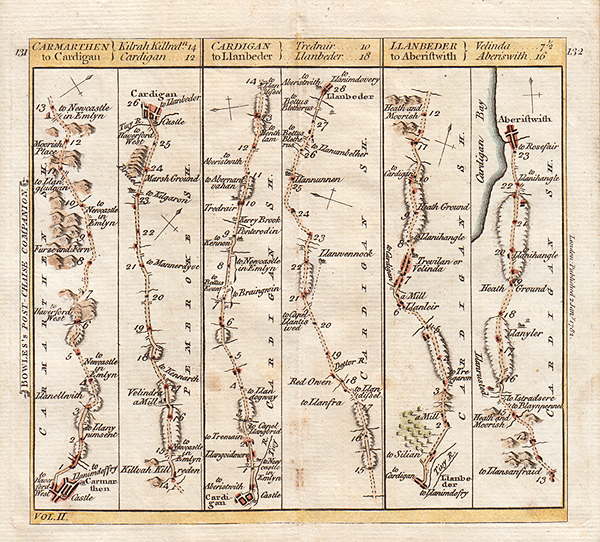 This is plate 119 and 120 and shows the road Llanfyllin, Montgomeryshire to Cardiff. Published in 1782 . Later coloured by hand.